Download the latest Perl SDK for your vSphere version from code.vmware.com and copy it to the system. The download is free, but an My VMware account is required. A new feature in vSAN 6.6 is the ability to silence Health Checks. In previous versions, it was already possible to disable alerts that are triggered by health checks. 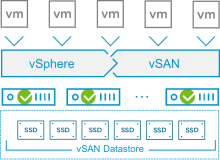 Silencing health checks is one step further and enables you to have a clean vSAN health. Silenced checks are displayed with a green checkmark and are marked as "Skipped". Especially for home labs, where unsupported hardware is used, this is a great feature. This article explains how to add AD authentication in vSphere 6.5 and how to get the "Use Windows session authentication" checkbox to work with the enhanced authentication plugin. This works for both, the vCenter Server 6.5 installed on a Windows Server and the vCenter Server Appliance (vCSA). In vSphere 6.5 the underlying operating system from the vCenter Server Appliance (vCSA) has been changed to VMwares PhotonOS. With the new OS, you can still join an Active Directory domain to comply with company policies, or if you want to use windows session authentication. Joining an Active Directory domain is included in the infrastructure node configuration which is part of the Platform Services Controller. Please verify standard AD requirements like time synchronization and naming prior to joining a domain. If you want to log in with the "Windows session authentication" checkbox, you have to add the appliance running the Platform Services Controller (PSC) to the domain. For embedded deployments, join the appliance running both, the vCenter and the PSC to the domain. Everyone knows the situation where you can't log into a system because you have forgotten the password. The following article explains how to reset the password and regain access to VMware vSphere 6.5 core components including vCenter, SSO and ESXi Hosts. When you've installed the vSphere Management Assistant 6.0 (vMA) you very like came across its very strict password policy. With this requirements, the password recovery for vMAs is a common tasks. This post explains how to recover forgotten vMA passwords and how to use insecure, simple passwords for lab uses. Please provide a password for the vi-admin user. The vCenter Server Appliance 6.0 uses the Linux Logical Volume Management (LVM) that allows you to dynamically increase the disk size of the vCenter Server disks. For the vCenter server itself the process to increase the capacity is well documented in KB2126276. When you have an external Platform Services Controller, the tool mentioned in the KB is missing. You can't use "vpxd_servicecfg storage lvm autogrow" to increase the space automatically so you have to do it manually. This post explains how to increase the disk space for an external platform service controller.